As Samsung geared up for the release of its latest Galaxy Tab S3, a 3D Graphics Performance report of said device appeared on popular graphics benchmark GFXBench, revealing some of its key specs such as a Qualcomm Snapdragon 820 processor and an Andreno 530 GPU. Previously, the Galaxy Tab S3 was believed to be equipped with Samsung's Exynos 7420 processor. 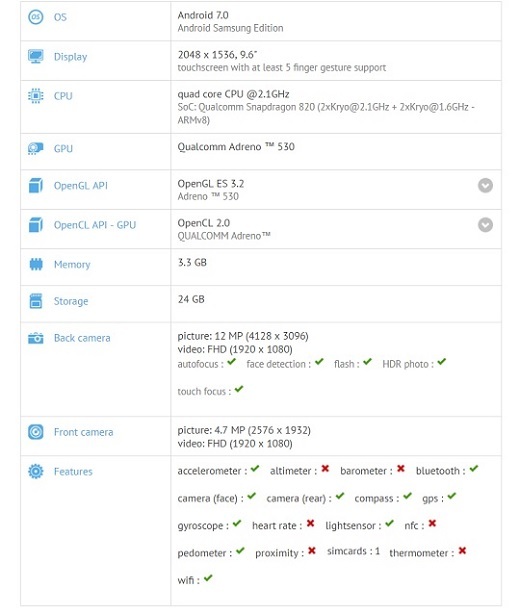 Apparently, the device will be sporting an even better 2.1GHz Snapdragon 820 quad-core chipset. The listing, however, confirms that it will indeed come with 4GB of RAM and 32GB of internal storage. In terms of aesthetics, Samsung's latest tablet will have a 9.6-inch display with a resolution of 2048 x 1536, as listed on GFXBench, which hardly makes any difference when compared to the Galaxy Tab S2, which had a 9.7-inch display. This could easily change on the actual product, though. What we know is that Samsung won't be unveiling a smaller model. The device will have a 12-megapixel main camera and a 5-megapixel front snapper. Both cameras will be able to record Full HD videos. Other specs include a USB Type-C port and a fingerprint scanner embedded in its home button. The new Samsung Galaxy Tab S3 already has Bluetooth and WiFi certifications, and will be available in both WiFi and LTE versions. We expect the device to be unveiled at MWC at the end of February this year.